Looking for a city map? 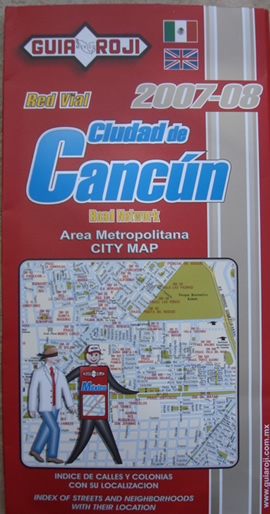 You can find a good Cancun map in any grocery store or supermarket. I've bought mine in a 7-Eleven. One of the best available series is GuiaRoji. Of course, on your arrival at Cancun airport you can pick up a tourist map (or several of them). These are normally limited to the hotels and are given away for free. They come with discount coupons of some sort for restaurants and bars and I guess for general tourism these will do. Most visitors won't come further than the Hotel Zone and the Market 28 area anyway. In souvenir shops you will also find very nice colorful maps of the Yucatan peninsula with wildlife and Mayan temples drawn into it. They even come with a CD-Rom. A neat memory of your Yucatan vacation! On the other hand if you plan on staying some extended time or even on buying property, you'll need a better Cancun map. The city of Cancun is divided into sections called Supermanzanas, meaning 'Big apples'. Each supermanzana has a number of Manzanas which in turn are divided into Lotes or Lots. A street adress is thus notated as 'Supermanzana 64, Manzana 7, Lote 15. The newer residential areas have names like 'Quetzales', 'Residencial Las Americas' or 'Cumbres'. At first this can be somewhat confusing. When we take a taxi, for instance, we direct the taxidriver by either the number of the Supermanzana (mostly for the older part of Cancun) or in other cases we use the name of the residential area ('fraccionamiento' in Spanish). The difficulty lies in when to use the first and when the second. But don't worry, you'll learn soon enough!